Rowe Pottery Works is one of the largest makers of hand-crafted pottery in the USA. Hand-crafted salt-glaze pottery is achieved by throwing crude salt into the kiln when the fire is intense. The salt instantly vaporizes to create a transparent glaze. The salt-glaze stoneware is truly indicative of early times, but adapted for everyday use. All Rowe Pottery items are dishwasher, microwave, and oven-safe. Everything is lead-free. In 2005, Rowe Pottery Works observed its 30th year in business. The 30th Anniversary Collection has many elements that make it unique. The artisans looked back over 30 years of pottery creations and selected items that were the most popular. All pieces are lovingly made to 1/4 scale - small in size, but large in character. They are bigger than Rowe's miniatures, but smaller than a regular sized item. One piece was released each month throughout the year of 2005. This Pie Plate features the popular Heart design; it is hand crafted in salt glaze pottery. In 2002 Rowe Pottery Works of Wisconsin started a dealer plan which they called "Certified Dealer Program". Each store that qualified was allowed to purchase this display tile for their store. 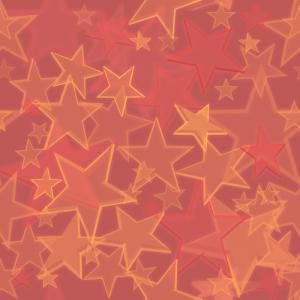 These tiles were never pictured in their catalogs; they were only available to order at a trade show. 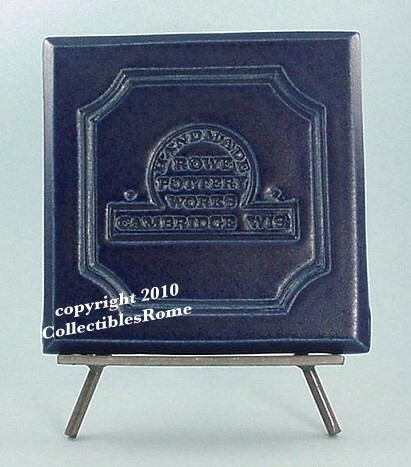 The famous Rowe Pottery Logo is impressed in the cobalt blue matte-finish surface. It is not dated, but as a Rowe Pottery dealer, we can guarantee that it was made in 2002. The tile is sized 6.25" x 6.25" square. We are offering the tile along with one of Rowe's wrought iron tile stands, which they made to display the limited edition Christmas tiles. Both the Dealer Tile and the iron stand are in perfect condition - no chips or cracks - from our store inventory. 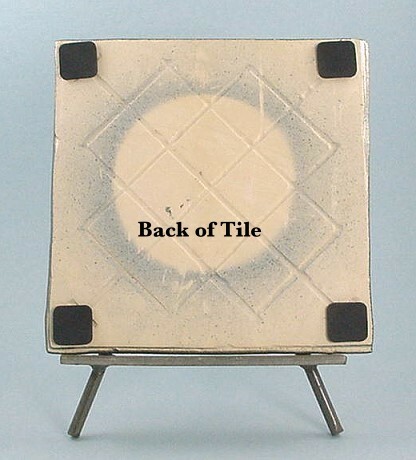 If you have a large collection of Rowe Pottery, this tile makes a great display to highlight the collection. This set is now retired. 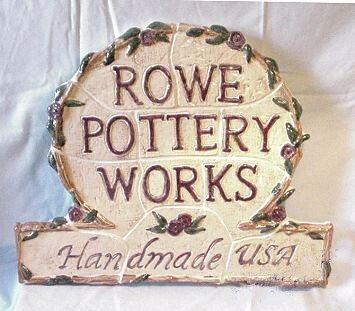 This sign was made at Rowe Pottery during the time that Jim Rowe owned the company. In 2002 Rowe Pottery Works of Wisconsin started a dealer plan which they called "Certified Dealer Program". Each store that qualified was allowed to purchase this large custom display sign for their store. The sign consists of hand-crafted & hand painted tiles that are mounted on a wooden cutout. The tiles are all finished & glazed. There is a wire hanger attached to the top on the backside & the wood back is painted white. The lettering is done in deep burgundy red on an antiqued ivory background. There is a tan vine-like design going around the edges, with flowers in burgundy with green leaves. This sign is BIG & HEAVY!! It is 25 inches wide & 20 inches high. We had this sign hanging in our store for several years, and it has been in storage for the past three years. It is in perfect condition. 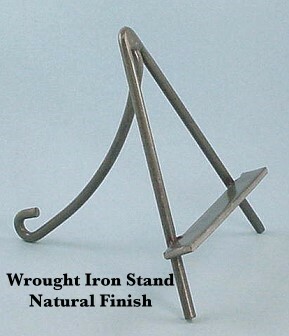 Has an indented place on the back so that you could hang in on a wall, but also use it for a spoon rest in the kitchen. Because of the handmade nature of pottery, there will be a variance in most every item. Availability is limited to handmade production. On some items, you will see "Retired". That means this item is no longer being made - we still have it available as long as it appears on our website.